As microprocessors have grown in size and complexity, it’s become increasingly difficult to increase performance without skyrocketing power consumption and heat. Intel’s CPU clock speeds have remained mostly flat for years, while AMD’s FX-9590 and its R9 Nano GPU both illustrate dramatic power consumption differences as clock speeds change. One of the principle barriers to increasing CPU clocks is that it’s extremely difficult to move heat out of the chip. New research into microfluidic cooling could help solve this problem, at least in some cases. Microfluidic cooling has existed for years; we covered IBM’s Aquasar cooling system back in 2012, which uses microfluidic channels tiny microchannels etched into a metal block to cool the SuperMUC supercomputer. Now, a new research paper on the topic has described a method of cooling modern FPGAs by etching cooling channels directly into the silicon itself. Previous systems, like Aquasar, still relied on a metal transfer plate between the coolant flow and the CPU itself. Here’s why that’s so significant. Modern microprocessors generate tremendous amounts of heat, but they don’t generate it evenly across the entire die. If you’re performing floating-point calculations using AVX2, it’ll be the FPU that heats up. If you’re performing integer calculations, or thrashing the cache subsystems, it generates more heat in the ALUs and L2/L3 caches, respectively. This creates localized hot spots on the die, and CPUs aren’t very good at spreading that heat out across the entire surface area of the chip. This is why Intel specifies lower turbo clocks if you’re performing AVX2-heavy calculations. 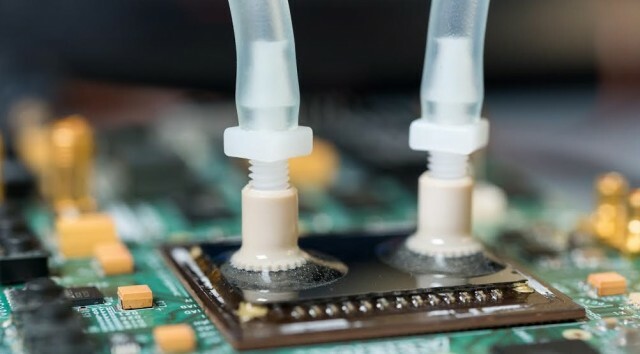 By etching channels directly on top of a 28nm Altera FPGA, the research team was able to bring cooling much closer to the CPU cores and eliminate the intervening gap that makes water-cooling less effective then it would otherwise be. According to the Georgia Institute of Technology, the research team focused on 28nm Altera FPGAs. After removing their existing heatsink and thermal paste, the group etched 100 micron silicon cylinders into the die, creating cooling passages. The entire system was then sealed using silicon and connected to water tubes. Could such a system work for PCs? 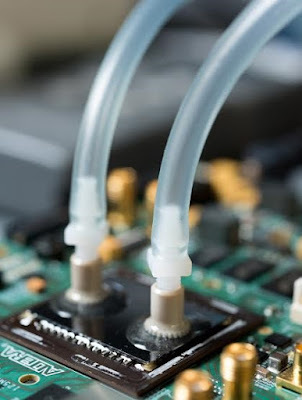 The team claims that using these microfluidic channels with water at 20C cut the on-die temperature of their FPGA to just 24C, compared with 60C for an air-cooled design. That’s a significant achievement, particularly given the flow rate (147 milliliters per minute). Clearly this approach can yield huge dividends but whether or not it could ever scale to consumer hardware is a very different question. As the feature image shows, the connect points for the hardware look decidedly fragile and easily dislodged or broken. The amount of effort required to etch a design like this into an Intel or AMD CPU would be non-trivial, and the companies would have to completely change their approach to CPU heat shields and cooling technology. Still, technologies like this could find application in HPC clusters or any market where computing power is at an absolute premium. Removing that much additional heat from a CPU die would allow for substantially higher clocks, even with modern power consumption scaling.